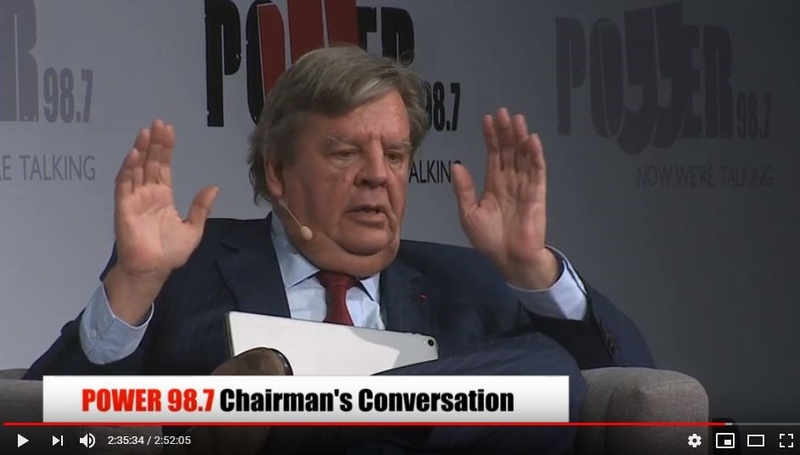 Johann Rupert throws his hands in the air after being called racist during an interview hosted by PowerFM. Johann Rupert, the billionaire businessman people love to hate, gave some interesting take-it-or-leave-it lessons in his conversation with Power987 chairman Given Mkhari. It would have been surprising had the conversation not caused controversy. Rupert is, in many ways, a controversial and very influential figure. But there's a risk that the lessons from the man whose businesses operate globally, help grow the pensions of workers, pay billions in taxes and employ thousands of people could be lost in the social media outrage about his "condescending" attitude. Mkhari specifically asked Rupert whether the desire to prove themselves drove the Ruperts to succeed in business. Rupert agreed. He spoke about the attitude of the Ruperts to work hard, study and save – ingredients of success. Rupert was also quick to point out that his family, like many Afrikaners, was once poor. His reference to the concentration camps of the South African War was, in my view, an attempt to provide a lesson that no matter the hardships – including being defeated in a war – everyone has the ability to rise and succeed. Let's strip off the politics and ask the question: who in South Africa – black and white – believes that they can succeed without the three ingredients? Surely, no one can say spending money in expensive clubs is an ingredient of wealth creation! We must appreciate this coming from a businessman who is invested in companies that produce top liquor brands and luxury goods. Rupert was essentially denouncing the culture of instant gratification, the display of crass materialism and low savings – all of which have in different ways been issues of public concern. In fact, the ANC in some of its discussion documents has mentioned these ills as the cause of the corruption that is devouring the moral fibre of the party and society. The government encourages people to save. It is true that many black people believe buying and showing off expensive luxury cars on credit and going to expensive clubs is a symbol of success. Didn't President Thabo Mbeki warn against this in his 2006 Nelson Mandela Lecture without singling out black people? Mbeki said: "It is perfectly obvious that many in our society, having absorbed the value system of the capitalist market, have come to the conclusion that, for them personal success and fulfilment means personal enrichment at all costs and the most theatrical and striking public display of that wealth." Unlike Mbeki, however, Rupert lacks political tact. He is also allergic to political correctness. It was therefore no surprise that a businessman who lacks the diplomacy of politicians would deliver a sensitive message in such a manner. But the audience have a choice: either they dismiss the "condescending" Rupert (who is he, after all, to tell black people what to do with their hard-earned creditworthiness?) or take the hard lesson and save instead of borrowing to consume. Of course, had he been politically wired Rupert could have repeatedly mentioned that being white and having had the benefit of apartheid to run government to their exclusive advantage, Afrikaners bought themselves generations of privilege at the expense of blacks. To his credit, he did acknowledge that his father was a member of the Broederbond. So what are some of the things we learnt from Rupert's poorly received interview? The Ruperts, being globally minded from early on, were not content with apartheid because it restricted their business ambitions. They were so immersed in business that Anton Rupert, Johann's father, once remarked that political democracy was less important than economic opportunities for blacks. He had overlooked the role of politics in shaping economic structures. His views were a consequence of undermining social sciences like political science. Anton Rupert studied chemistry and believed fields like political science were not useful. Second, when asked about how blacks could access his experience and opportunities from his business, Rupert provided a long answer. At the heart of it is this: how could black people be seen to be doing business with him and escape labels for being associated with or captured by "white monopoly capital"? He immediately provided an answer to the rhetorical question he had posed: black people must develop the necessary confidence to do business with whomever they wish. Again, the audience can dismiss Rupert and succumb to the political labelling. Or they can withstand the labelling and grow their businesses with partners regardless of their race. Interestingly, Anton Rupert once expressed the idea of 50/50 business partnerships with black people in the homelands but the apartheid government told him to "stop causing problems". Third, Rupert agreed there was a need to address historical racial inequality of property ownership because black people were stripped of property ownership. Despite his lack of diplomacy, he appeared to be in tune with ANC sentiments on the land question. He is clearly opposed to the EFF policy of nationalisation. He supports expropriation without compensation subject to the conditions stated by the ANC and subject to land being productive and black people being given title to the land. He sponsors the Free Market Foundation that has been working with municipalities to give black people title to the homes they have lived in for years but couldn't claim ownership due to apartheid property laws. He doesn't support nationalisation, Venezuela style, or violent land seizures of the Robert Mugabe era. Fourth, Rupert believes in the free market system. Under this system anyone can work themselves to success. It's not about race or genes. The two Koreas and the pre-Cold War West/East Germany are examples of which economic system has worked well. Fifth, he spoke about corporate politics that he and his father had to face at different stages of their business careers. He shared some valuable insights about the importance of building loyalties in business. Sixth, Rupert believes there must be accommodation between Afrikaner nationalism and African nationalism to ensure peace and stability. It's an issue he once discussed with Black Consciousness leader Steve Biko. Rupert is right about the need to find a middle ground between the two extremes. His concern seemingly clearly shows that some Afrikaners feel, as he put it "endangered". But he could have done better to show appreciation for Biko's teachings. The rise of Afrikaners from the ashes of war and poverty required the restoration of pride. Biko advocated a more human and inclusive version of pride for black people whose suffering had run over centuries. The Constitution of the country offers the best version of the accommodation Rupert referred to, as it recognises the inherent dignity of all individual citizens. It doesn't elevate the antagonistic race-based nationalisms of AfriForum and the EFF/BLF. Seventh, billionaires desire recognition. Rupert takes pride in the fact that the tax authorities in Switzerland where one of his companies, Richemont, is based sends him thank you letters for paying taxes. The sub-text: SARS must appreciate taxpayers. Eighth, Rupert gave a lesson about the importance of companies having a single controlling shareholder that other investors can trust. It takes time and effort to build the trust. This makes companies less vulnerable to take-overs by vultures. Controlling shareholders are best placed to look after a company in the long-term. Ninth, Rupert is proud about his Afrikaner background, but he is not trapped in the past. His grandmother might have told him not to marry an English woman, probably due to the English-Afrikaner acrimony under which she grew up. But Rupert actually does business with anyone. Tenth, he believes people, including those who actually run his companies, should take responsibility for the challenges they face. You are allowed to make mistakes, but don't repeat the same mistake. If Mkhari's plan was to get Rupert to share with Power987's mostly black audience a few hard lessons in business, he has achieved it. But only if black people cut out whatever is obstructing us from learning from the successes of others. - Mkhabela is a former Power 987 station manager and regular columnist for News24.